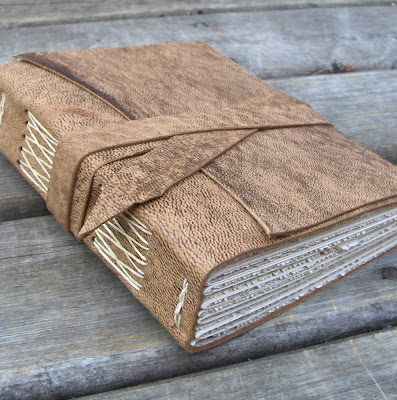 My Handbound Books - Bookbinding Blog: What colour is this? When I add new journals to my Etsy shop, I try to include colour descriptors that are meaningful, using words that might help people envision the colours accurately in spite of the unreliability of computer monitors around the world. So the leather isn't just brown, it is dark chocolate. Or it is not just green, it is jade. That sort of thing. Now. I have this leather. It is kinda beige or maybe sand. But it has darker areas. It is sorta distressed but not really. I can't think of any clever colour descriptors. What do you think? It reminds me of a root beer float! My suggestion is not as appealing as a root beer float! But, my first thought was "mottled brown." I like mottled brown since it really isn't taupe which was my first descriptor. looks like light mocha distressed leather to me. The best colours have no names. How about Cafe Au Lait? First thing that came to my mind when I looked at this was espresso with milk, or espresso macchiato. Oooh! I have one more--Walnut!! i just added "espresso macchiato" to the title of a book in my shop, thanks maria! see here. I also like butter brickle, and mottled, and sahara, and walnut, and cafe au lait... there will be more books I will use them all! Long ago I bought a pair of shoes described as "antigue camel." Then my mother bought a pair which looked exactly the same, but were called "old sirocco." For what it's worth, the shade was pretty close to your leather! I would suggest tree bark. oh those are good suggestions too, thanks! Actually, have you ever eaten the Italian desert called Tiramisiu? It's made with Ladyfinger cookies soaked in coffee flavoured liqueor, and the cream is light coffee coloured with a dusting of cocoa powder. The whole creamy mixture, like a soft pudding, looks exactly like your leather!! Tiramisiu Leather. where do you get your leathers for your books? i like the sound of old sirocco. oh Tiramisiu, yes! iced caramel macchiato... and of course mushroom... wow, i couldn't think of anything now look at all the options!